This question has haunted me. You see, I inherited my father’s DNA, which means I like to capture information by cataloging or categorizing it. So I developed a system. An address book system. It isn’t simple, it takes time, but I find it hard to deviate from the plan. Even, as I recently discovered, when I’m three years in arrears. I bought a plain lined journal with pages that are 8 x 5½. I put the alphabet in the top right corner of several pages. Sure enough I did not leave enough room for B’s, C’s and H’s. I transferred my addresses in pencil including phone numbers and emails. Two addresses to a page is about right. Leave the left page blank. To the right of the addresses I put names of kids, pets (if the pet’s names are important) and birth dates, if I know them. In the margin at the left I write in when I mail (or give) our Christmas letters: 05, 06, 08, 10. One day my brother called to tell me that my girlfriend’s mom had died. How did you find out? I asked. My girlfriend’s husband had taken the deceased’s address book and called everyone in the book. From that anecdote, I added another feature: I note the relationship in the column. Online friend, former pastor, Carol’s friend from Lombard, Klamath Falls neighbor, college friend. If we share last names I think that is obvious enough. Some addresses are old and stale. Rather than erase them, I note Archive in the column. I hope my kids know not to call the Archives when I die. Now we’re ready to process Christmas cards and letters. We need: address book, eraser, scissors (I use plain and deckled) pencil, pen, scotch tape or glue stick, recycle bin, wastebasket. 1. Christmas card with printed signature: check address, recycle. 2. Christmas card with photo enclosed or a Photocard. Check address, trim photo and tape to address book on page across from address. If there are many photos, I start stacking them (tape one above the other). 3. Letter and photo. Check address, read letter, make notes next to people’s names in address book. John (ASU), Ariel (horses), Mandy (swim team). Trim photo, attach to address book. 4. Christmas letter with photo embedded. Same as above; after notes are made, trim photo and attach to address book. When all the Christmas cards are processed, I usually have a stack of photos for my cork board, a thicker address book, and notes in my prayer journal. In theory, I am ready for the next round of letter sending. How do you do it? Any tips to share? This entry was posted in Uncategorized and tagged mylife, organization by alivingpencil. Bookmark the permalink. 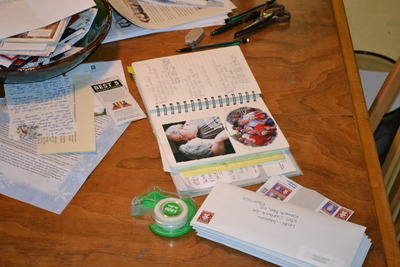 Another scrapbook-in-the-making is one of our own card/letters/pictures sent over the years. I’ve got them all in the book, but havent pasted things in yet.I like 3M spray adhesive and rubber cement over scotch tape, fwiw. @hiddenart – Rubber cement! I haven’t thought of that in YEARS, but I used to go through it like mad. Fun! @mcarmody1 – You crack me up! “That way my kids don’t have to call anyone when I die” – I love it! I am in awe. When my nest is a little bit emptier, I will probably institute a variation of your system, using a looseleaf notebook so I can insert pages when necessary. I used to be so good at keeping up with addresses, but I have been shamefully lax in recent years. This is great. I shall have to go BACK through my Christmas cards now! I almost just stuffed them in the “box” this year but decided to sit down and go through them one more time. I was so glad I did as I discovered a gift card someone had given us that had gotten stuffed into the Christmas cards! I generally take note of new addresses and put them in a box to be turned into placemats. When my kids were younger they loved those placemats. They are also nice gifts of Grandma and Grandpa’s or those in nursing homes. I’m going to implement some of your suggestions now too! Wait…if you put the photos in the book…where did the stack of photos come from for your corkboard? Are they the old ones?We just throw the pictures in the box (to be deal with some day) and recycle the Christmas cards into gift tags. @jackug – Do you use folders for your email? My son was home for college once and insisted I start folders for different correspondents. That helped immensely. And if I forget to change an email address, I usually find out when it bounces back.